Would you like to discover Vietnam from another point of view? Would you like to feel the real essence of Vietnam? The best way to know one country is by meeting local people and living among them. We have designed this tour in order to explore the culture at each destination, join many interesting activities, taste many local foods and learn about the local people’s lifestyle. 08:00am Head for the southwest of Saigon for two hours, and along the way notice lush rice paddies and fruit farms emerging alongside the highway. 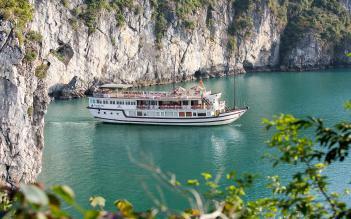 Upon arrival in Cai Lay, board a charming wooden boat to enjoy the countryside scenery and river life. Stretch your legs a bit and hop on a local bicycle for a lovely ride of about 7km (over easy terrain) along narrow, shade covered village lanes, fruit orchards and local cottage industries. Locals will often greet you with a hello or “xin chao” as you pedal by. Arrive at home of a tropical fruit farmer and have a walk with him around his orchard. Enjoy the opportunity for tasting fresh fruits picked right from the trees. Then relax and enjoy the view from a small sampan boat as you are paddled slowly along idyllic canals. Disembark and continue your ride to a local home for a home-hosted lunch of Mekong Delta specialties. After lunch, keep riding to a garden house where you will spend the night with a friendly family. Opt to wander to the surrounding areas or have a little chat with the hosts for a better understanding of agriculture river life. Your new exciting day starts with a typical breakfast prepared by our hosts. Then pedal back to a tea house to embark your boat for one hour boat ride to Cai Be. Relax while enjoying the countryside scenery and river life! Arrive Cai Be, visit the colorful floating market, stocked with many boats bursting with fruits, vegetables, and other products for sale. Traders have lived on the river in their boats for generations and have become incredibly inventive to sustain life on the river. If you are an adventurous traveler, try some local fresh fruits purchased directly in this unique market. Disembark and visit some further local industry cottages before proceeding to an ancient house for your lunch. 15:00 End tour at your hotel in Ho Chi Minh. Leave Ho Chi Minh City at around 7.30am. Visit agricultural villages with cow and buffalo areas, lush rice fields and vegetable areas. It is a chance to become a real Vietnamese Farmer wearing a Vietnamese traditional hat and picking up a lot of herbs, spices, vegetables and mushrooms on the garden. At around 10.am, start with cooking Challenges. Hands-on cooking class with three dishes and 1 dessert and enjoy what you have done. Enjoy Great Healthy Cooking Tips and congratulation with nice certificate, recipes, and souvenirs. After that, start an interesting trip with Cu Chi Tunnels. This incredible system, covering almost 250km in length was shelter to over 16,000 Vietcong guerrillas during the wars. Initially started in 1948 to provide shelter against the French air and ground sweeps, the network went on to serve as communication routes, storage facilities, hospitals and living quarters for Vietnamese fighters throughout the American war. If you are interested (and game) you can even descend into the tunnels to learn more about the harsh conditions faced by Vietcong guerrillas who lived there. At the end of the trip, tasting boiled tapioca, drinking hot tea before drive you to Ho Chi Minh Airport for your evening flight to Hue. On arrival Hue airport, meet your local guide and be transferred to your hotel for check in. Dinner on your own. Overnight at Hue hotel. Have breakfast at your hotel and start today tour at 08:00am. In the morning, visit to the majestic Imperial Citadel of Hue, located along Perfume River. After that, visit a beautiful garden house where a charming Vietnamese couple will welcome you. The landlord will give you a guided tour of the various centenarian buildings, which make up the house and then he will invite you a cup of tea with traditional cakes. 16:30: End of the tour at your hotel. 08:00am Leave your hotel by private vehicle to Thanh Tien Village. You might wish to stop en route to capture typical moments of local life and beautiful landscapes (French cows, churches…). This is an opportunity to discover the charms of the Hue countryside, its ancient villages, its pagodas and churches as well as its rivers covered with lotus flowers (subject to weather conditions). Thanh Tien village is located along the Perfume River famous for its traditional handcraft production of paper flowers and it has been dated back around four hundred years. You can observe the works and participate in the creation of flowers under the guidance of a craftsman. At about 15:00, begin your interesting biking tour (about 12 kilometers) along the poetic Nhu Y River, from Vinh Ve village to Chuon Lagoon – a part of famous Tam Giang Lagoon (around 1.5 hour biking). The scenery of the ancient village will captivate the visitors for the traditional architectural beauty of old pavilions, the sophisticated pattern of family temples with charming dragon carvings, the rustic winding paths and the meandering streams of the river leading visitors through the golden paddy fields stretching as far as Chuon Lagoon is. Here, you will embark on a boat to start your amazing lagoon excursion. You will not only enjoy the beautiful scenery but also learn about the daily floating life of local people on the lagoon: very interesting and also very poignant. Then, visit 1 or 2 local stilt houses on the lagoon, enjoy some delicious dishes of grilled seafood and local beer. Finish of the tour, our car will take you back to your hotel at about 17:30. 08:00am Depart by car to Da Nang (105km – 2 – 2.5 hours driving) via the scenic Hai Van Pass, where we will enjoy the spectacular panorama of the central coastline from the summit. Stop at Lang Co to stretch your legs on the white sands of this peaceful beach. Upon arrival in Hoi An, check in to your resort. After a short rest, take a stroll to visit Hoi An town, recognized by UNESCO as a World Heritage site because of its unusually well-preserved ancient streets and homes. Set out to explore the quaint cobblestone streets of the town with the more than two-century-old Chinese houses. Sites including the Japanese Bridge, the Chinese Temple, and Phung Hung Chinese-trading house. Stop at the local market to see the daily activities of Hoi An people. Our guide will invite you to taste some local foods. At the end of the day, you will have a memorable time for enjoying a cup of tea or coffee at "Reaching Out Tea House" - a very special and unique ancient house where offer you not only a fabulous drinks and snack but also the soul values. 17:00 End tour at your hotel. 08:00am We depart the hotel for a discovery around Hoi An. Embark on a boat for ride to the mouth of Thu Bon river to enjoy the daily activities of fishermen, such as throwing a fishing net and trading their products. Your boat then, will continue cruising for about half an hour to a fishing village. We will move to a smaller bamboo boat (a coracle) to discover a distinctive mangrove forest. Under the blurry sunlight inside the forest, you might feel a mysterious atmosphere covering this whole area. This excursion also gives you a chance to admire skillful fishermen, who are working in the forest. Back to the tourist boat and anchor in the middle of the river to prepare food. Enjoy meal with some local food of Hoi An. In the afternoon, you will depart from the pier located in the old city of Hoi An on a local boat, the only mean of transport to sail to the island of Cam Kim. After a crossing of a few minutes, you will reach the village of Kim Bong, and then visit M.Huynh Suong’s workshop, a famous sculpting artist who will teach you about his art. Then, you will ride your bikes towards the mat weaving village of Duy Vinh. Over the 13-km route, you will enjoy the landscapes of rice fields, bamboo fields and shaded paths. Once in the village, you will discover its traditions and special know-hows, which have been passed on from generation to generation. Visit a local house and enjoy a cup of tea and seasonal fruits, you will have a chance to see people weaving mat step by step. At good time, leave your hotel to Da Nang Airport for a short flight to Hanoi. On arrival, meet your local guide and be transferred to your hotel for check-in. Lunch on your own. In the mid afternoon, start the street food tour. Our guide will take you to see some of the markets and establishments that are frequented by the Vietnamese locals. Most of the tour will be outside of the touristic areas that are listed in the guidebooks. Drive to a nearby local market to learn about and taste some of the ingredients used in the local cuisine and to watch the buying and selling rituals in a Vietnamese market. Our guide will introduce you to some of the vendors, explain about the ingredients for sale and assist you with purchasing items to take home. Many photo opportunities will be available in this bustling, vibrant and colorful scene. Enjoy a Vietnamese Cà Phê (coffee) or Trà (tea), for example Café Giảng, one of the many sidewalk cafes in the historic French Quarter. Here the guide will give an overview of the Vietnamese food scene, particularly in Hanoi, and discuss the daily life and culture of Vietnam. After, drive (or walk) to Truc Bach lake for a snack of “ Phở Cuốn”, a grilled beef and rice noodle roll with fresh herbs, served with several other favorite local snacks. Back to your hotel at the end of the tour. Overnight at the hotel. 08:00am Start half day tour of Vietnam’s capital city, including Ho Chi Minh’s Mausoleum, his traditional stilt house and the revered One-Pillar Pagoda. After that, visit Vietnam’s first university ,and the thousand-year-old Temple of Literature. Around noon, we will invite you to a local house for lunch to get a feeling of daily life of a Hanoian family. After lunch time, our guide will invite you for a walking tour around Bat Trang ceramic village. You will have a chance to observe the art of making ceramics by hand and visit family factories all over the village. We will stop at the Dinh Bang communal house. Traditionally, all villages in Vietnam had a community house in the center of the village, which was the site where all decisions regarding village matters were made. The house connected everyone to the village and was the core of Vietnamese culture. 16:30 Back to your hotel at the end of the trip and free at your leisure. Must-do package Overall trip was good. Visited quite a few places throughout Vietnam. Guides were good though some struggled a bit with English. Hotels and food were generally good. Fabulous The tour was fabulous ... Very busy not much down time. We had private guide in all but last city... Cars were very comfortable and guides very knowledgeable. Trip was most excellent for myself being it was my first time going there. 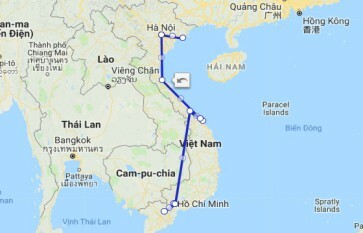 For any novice who wants to go to Vietnam.. should try this tour. Definitely may return again but starting from the north to south. highly recommended Guided yet independent travel! You always have the support of the travel team! We touched on many cultural sites on this tour, the guides were fantastic, knowledgeable and friendly! Recommended!